The Netflix stock price has now climbed 15.2% since Sept. 29. That's a huge rebound for the stock after it fell 20% between Aug. 17 and Sept. 4. 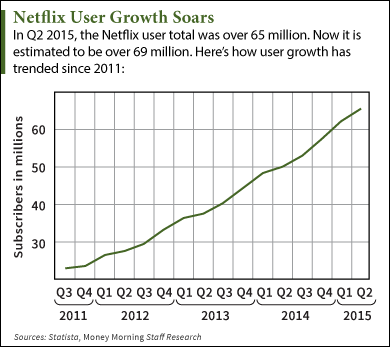 While a $1 raise per month seems small, Netflix now boasts more than 69 million global customers. When the subscription raise is fully integrated, that's another $69 million per month in revenue for the company. Over a year, that translates to roughly $828 million in revenue. That price raise is part of the reason that Pacific Crest Securities raised its Netflix stock price target to $140. That's 22.7% higher than today's opening price of $114.11. Robinson is also encouraged by the company's growth trajectory. It's estimated that the company now has roughly 69 million global subscribers. This time last year, it had just over 53 million. In October 2014, it was just 40 million. If you go all the way back to October 2012, the total was 29 million. Netflix Stock Price Climbs Today – Is It a Buy?